Just about every piece you write has a headline. Call it what you want – a title (article), a subject line (e-mail), a banner (newsletter), teaser (outer envelope), a Johnson box (direct mail letter), or even a caption (photo). No matter how you identify it, this short bit of text has an enormous responsibility. Its job is to get the reader to keep reading. That’s why it’s a disastrous mistake to treat it as an afterthought. Because if this little group of words doesn't do its job, then the rest of your piece won’t even get read. My mail box, in-box and to-read stack are all overflowing. I’m sure yours are, too. I actually looking for an excuse to toss a piece into the trash or click “delete” – just to simplify my life. You would have zapped those bytes out of your box and let out a sigh of relief at one less message to read. I know I would have! Why? “Headlines” is a huge topic that can go in a zillion different directions. I don’t have time to figure out if the e-mail would help me or not, so there’s absolutely no compelling reason for me to read any further. That headline failed to do its job (which by now you know is to keep the reader reading). It rouses curiosity. “Does your headline do its job?” makes you want to keep reading because you’re interested. You want to discover the answer to the question. It’s a complete thought. 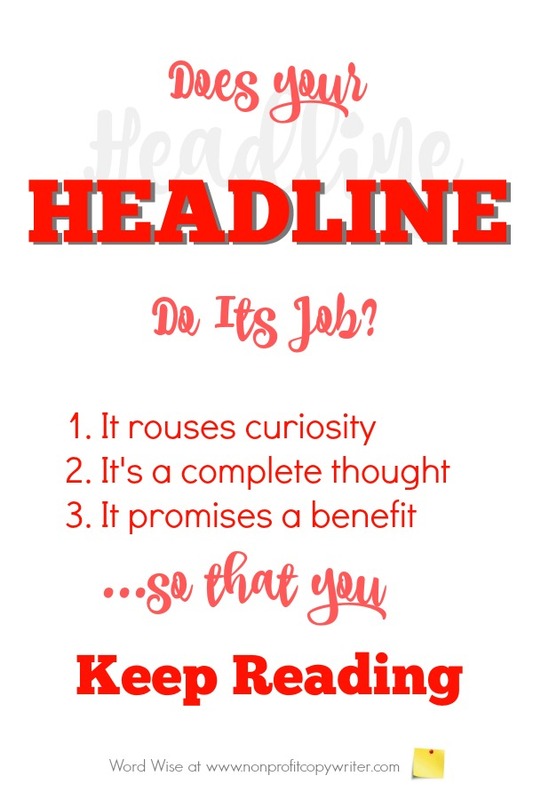 “Does your headline do its job?” makes you want to keep reading because it’s a focused concept – an idea that’s a manageable, rather than overwhelming. It promises the reader a benefit or result. “Does your headline do its job?” makes you want to keep reading to find out practical how-to information or guidelines. This one did. Because you kept reading.